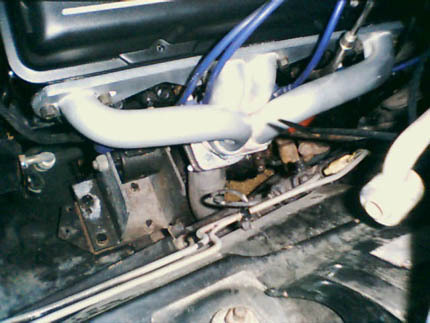 typical XJ6 installation is below. Everyone knows that providing a more free-flow exhaust will increase engine power, and installing tubular headers has been on an age-old V8 trick. 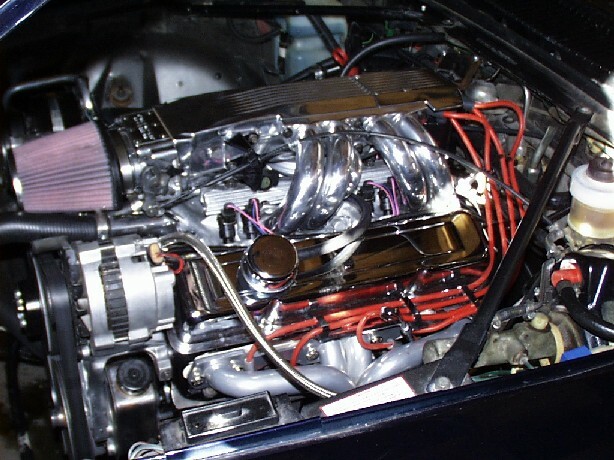 However no one ever really developed a header set for the Jaguar V8 conversion cars. Now Jaguar Specialties offers the only professionally made headers to fit Jaguar V8 conversions, and they are made by world-renowned Sanderson Headers. These are high quality units that feature a patented flange design that requires no gaskets (!!!). Other great features of the headers include a thick 3/8" flange, 16 gauge 1 1/2" primary tubes, and a 16 gauge 2 1/2" collector. The header set comes with all required mounting hardware, and matching flanges for your headpipes. The basic design of the header is nearly identical to the 80-82 factory Corvette parts. Back in 1980, GM and Chevrolet (for whatever reason) only offered a 305 V8 in the Corvette for California. 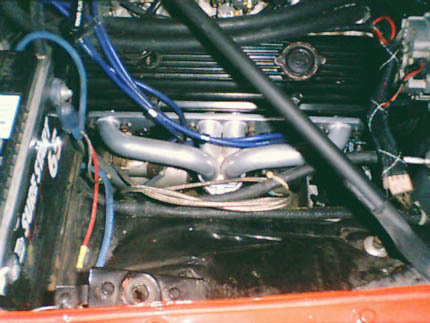 To offset the expected power loss going to the smaller engine, the engineers designed a set of free-flow header-style manifolds to replace the cast iron (ram horn) parts. Well, these flowed so well that the 1980 Corvette 305 was rated at 190 hp, only 10 hp less than the 49 state L-82 350 (rated at 200hp). Besides displacement, the only real difference between the engines was the exhaust manifolds!! These performance headers for the Jaguar are very close in design to those original pieces, so it is reasonable to expect a good power gain when switching to them from cast iron. The headers can be modified easily by the end user for the addition of air injection if needed for pollution control. Just use Hedman air injection kit # 22830, available from Summit or other speed part dealers. The headers will fit conversions using carbureted, TBI, TPI, and LT1 engines (sorry, not for LS1 LS2 LSx conversions) and done with Suncoast, John's Cars, Mundorf, JTR, and even most home brewed engine mounts. I've included some photos of the headers on various mount styles- take a look to judge the fit for yourself. If you have some question about which mounts your car uses, please Email me a photo of them- I should be able to tell. For those Jaguar conversions using very built (high horsepower) or larger cubic inch engines, we offer headers in a "super flow" version as well. The super flow headers utilize 1 5/8" primary tubes and a 2 1/2" collector. These higher flow of headers should be used with a comparable higher flow exhaust- minimum 2 1/4" pipe diameter, high flow mufflers, and an under-the-diff" type tailpipe arrangement. For more info, please Email or call. 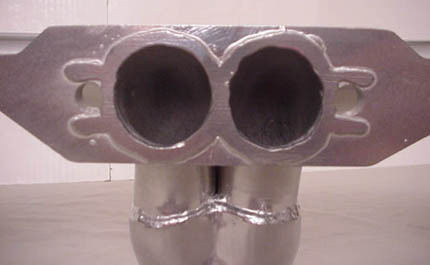 Note- If you are planning to use a later model LT1 engine (93-97, with aluminum heads), or GM "Fast Burn" heads, these headers can be ordered with the correct D-port design. For any conversion using these heads, these special headers are required- standard Corvette (ram horn) cast iron manifolds will not work as they have the wrong port shape and will diminish exhaust flow. 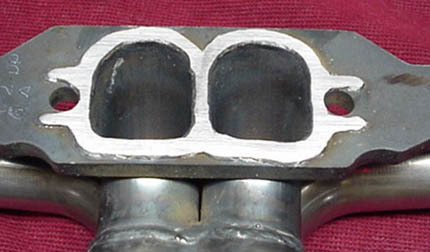 A photo of the headers with the correct "fast burn" D-port configuration is below.